The Primary Goal for the Wet Tropics World Heritage Area is to implement Australia’s international duty to protect, conserve, present, rehabilitate and transmit to future generations the Wet Tropics World Heritage Area, within the meaning of the World Heritage Convention. The Wet Tropics World Heritage Area fulfils all four criteria described for inclusion of properties on the World Heritage List as a ‘natural heritage’. The most important and significant natural habitats where threatened species of plants and animals of outstanding universal value from the point of view of science and conservation still survive. The rainforests of the Daintree contain outstanding examples of flora and fauna representing eight major stages in the earth’s evolutionary history. These include the Age of the Pteridophytes, the Age of the Conifers and Cycads, the Age of the Angiosperms, the final break-up of Gondwana, biological evolution and radiation during thirty-five million years of isolation, the origin and radiation of the songbirds, the mixing of the continental biota of the Australian and Asian plates and the extreme effects of the Pleistocene glacial periods on tropical rainforest vegetation. The most important living record of the evolutionary history of the marsupials, songbirds and terrestrial vegetation, from the very first land plants to the higher angiosperms, is contained within the area. One of the most significant evolutionary events in the history of the world was the adaptation of plants to life on land. The first land plants were the fungi and algae of the Ordovician Period, some 500 million years ago. Spore-producing plants including clubmosses and ferns reached their greatest diversity in a period referred to as the Age of the Pteridophytes, beginning in the Silurian Period some four hundred and thirty five million years ago and extending through to the Devonian and Carboniferous Periods, which lasted until approximately 280 million years ago. Within Daintree Rainforest, outstanding examples of primitive relict flora represent this period. The most primitive plants found within Daintree Rainforest include Huperzia (Tassel ferns – formerly Lycopodium), Selaginella, Lycopodiella, Psilotum (Ribbon ferns), Marattia and Angiopteris (King fern). Terrestrial vegetation underwent a significant evolutionary breakthrough with the origin of the seed. Towards the end of the Carboniferous Period, the dominance of the ferns and clubmosses came to an end with Australia’s movement as a part of Gondwana to the colder and drier climate nearer to the South Pole. Plants evolved with tough and hardier leaves and new reproductive strategies utilising stationary female cones and pollen as mobile, semi-protected male seeds. These adaptations allowed the colonisation of terrestrial habitats that were previously inhospitable to spore-producing plants. The lower end of the Carboniferous Period brought diversification of vascular plants. Gymnosperms dominated the Permian Period and small palm-like plants called Bennettitaleans, developed alongside. The climate of the Jurassic Period was substantially warmer and saw the proliferation of cycads and conifers and the extinction of the Bennettitaleans. The cone-bearing cycads and Southern Conifers have changed very little from Jurassic ancestors that flourished between one hundred and ninety-five and one hundred and thirty-five million years ago. Daintree Rainforest contains the Kauri pine Agathis robusta, the Brown Pine Podocarpus grayae and Hope’s Cycad Lepidozamia hopei. These species represent the closest modern counterparts to those found in the Jurassic fossil forests revealed in the Talbragar Fish Beds near Gulgong in New South Wales. Five major elements in the evolutionary history of the flowering plants are contained within the Daintree rainforests. The Mesozoic Era, beginning with the Triassic period, two hundred and twenty-five million years ago, and containing the Jurassic and Cretaceous Periods brought dramatic evolutionary change for the flora of the world. The origin of the flowering plants remains unknown due to the absence of any fossil record linking flowering plants to more primitive ancestral stock, though this does not diminish their spectacular success. At around about the time of the separation of Gondwana into its east and west portions, some one hundred and twenty million years ago, angiosperms were established and began diversifying in two essentially separate streams. A significant part of the southern stream became isolated when Australia finally broke away from Antarctica, drifting northwards towards the equator over the following fifty million years. Daintree Rainforest contains the richest assemblage and highest concentrations of ancient flowering plant families on earth. The most ancient orders of living flowering plants are the Magnoliales and Laurels. Of the world’s nineteen known families, twelve are found in the rainforests of the Daintree compared with seven in the whole of the Amazon basin. Two primitive flowering plant families found in the Daintree, Austrobaileyaceae and Idiospermaceae are monospecific. Several groups of fauna found in Daintree Rainforest are regarded as likely relicts of Gondwana at the time of the final break-up. Frogs from the Myobatrachidae and Hylidae families are believed to have had Gondwanan origins. Primitive species within these families found in the Daintree Rainforest include the Northern Barred Frog Mixophyes schivelli, the Sharp Snouted Torrent Frog Taudactylus acutirostris, the Blunt Snouted Torrent Frog Taudactylus rheophilus, Day’s Frog Nyctimystes dayi and an abundant representation of species from the tree frog genus Litoria. The Northern Leaf-tailed Gecko Phyllurus cornutus (left & right) and the Chameleon Gecko Carphodactylus laevis (centre) inhabit Daintree Rainforest and have been used as evidence of Gondwanan origin. The Southern Cassowary Casuarius casuarius, the Orange-footed Scrub-fowl Megapodius reinwardt and the Brush Turkey Alectura lathami are accepted as having Gondwanan origins. Biological evolution and radiation during thirty-five million years of isolated rafting of the Australian continental plate Sclerophyll flora and marsupial fauna that now dominate the Australian landscape have evolved from the exceptionally high concentration of remnant ancestral stock contained within Daintree Rainforest. The most primitive of the Australian marsupials, the carnivorous Dasyuroids are represented within the Daintree Rainforest. The Musky Rat-kangaroo Hypsiprymnodon moschatus is the most primitive of the kangaroos. It is the only living member to have retained the mobile first toe on its hind feet, which is otherwise characteristic of possums. There are compelling arguments suggesting that the world’s songbirds may have evolved from Australian ancestral stock. Likewise, Australia’s songbirds seem to have evolved from ancestral stock that remain tropical rainforest inhabitants. Many of the rainforest birds of the Daintree hold vital clues to the origin, evolution and radiation of songbirds within Australia and the world. The relatively recent geophysical development of the New Guinea landscape precludes the possibility of providing an evolutionary stage for its own diverse bird-life. The northern rainforests of Australia provided the more likely circumstances with a land bridge to New Guinea allowing the coincidental habitation of Cassowaries, Kingfishers and Chowchillas. The Australian and Asian continental plates are believed to have collided about fifteen million years ago, in the vicinity of what is now the Timor region. This collision was a unique event in that it mixed two evolutionary streams of flora and fauna of likely common origin, which had been essentially separated for at least eighty million years. Other continental collisions allowing a mixing of biota have occurred, but none with such a period of separation prior to collision. Plant genera within Daintree Rainforest believed to have entered Australia following the collision between the Australian and Asian continental plates include Alangeria, Calophyllum, Canthium, Garcinia, Leea and Trema. Of Australia’s sixteen species of Microhylid frog, twelve occur in the wet tropics and Daintree Rainforest is habitat for at least four including the Robust Frog Sphenophryne robusta, the Rain Whistling Frog Sphenophryne pluvialis, Fry’s Whistling Frog Sphenophryne fryi and the Elegant Frog Cophixalus concinnus. Non-migratory rainforest birds inhabiting Daintree Rainforest that are believed to have arrived following the collision with the Asian Plate include the Yellow-bellied Sunbird Nectarinia jugularis, the Mistletoe Bird Dicaecum hirundinaceum and the Metallic Starling Aplonis metallica. The placental mammals of the rainforests of the Daintree, including the bats and rats, are believed to have entered Australia via the connections with the Asian Plate. The Bush Rat Rattus fuscipes, Cape York Rat Rattus leucopus, Spectacled Flying Fox Pteropus conspicillatus, Tube-nosed Bat Nyctimene robinsoni, Northern Blossom Bat Macroglossus minimus, Queensland Blossom Bat Syconycteris australis and the Golden-tipped Bat Phoniscus papuensis, are prominent examples. The Water Rat Hydromys chrysogaster, White-tailed Rat Uromys caudimaculatus, Thornton Peak Melomys Uromys hadrourus, Fawn-footed Melomys Melomys cirvinipes and Prehensile-tailed Rat Pogonomys mollipilosus, are thought to have arrived in Australia via a second wave of rodent entry across the land bridge joining New Guinea, to form a part of the ‘Old Endemics’. Australian rainforests contracted severely during the Pleistocene glacial periods causing extinctions, speciations and profound changes to the distribution of flora and fauna. The rainforests of the Daintree contain outstanding examples of ancient lineage that survived these otherwise devastating impacts. They include the Kauri Pine Agathis robusta and Gymnostoma australianum. The long-isolated ancient floras of New Caledonia, Madagascar and the Australian Wet Tropics have exceptionally high levels of endemism. These centres of endemism are diverse pools of unique genetic material retaining elements over the widest evolutionary time span and containing potential significance for future radiation in a world of changing global climates and ongoing continental drift. The Australian Wet Tropics centre of endemism is unique as a part of an ancient continental, as opposed to island, landscape, uplifted more than 350-million years ago and tectonically stable for the greater part of the period of angiosperm evolution. Northern Australia has been postulated as a major centre of evolution of rainforest flora. 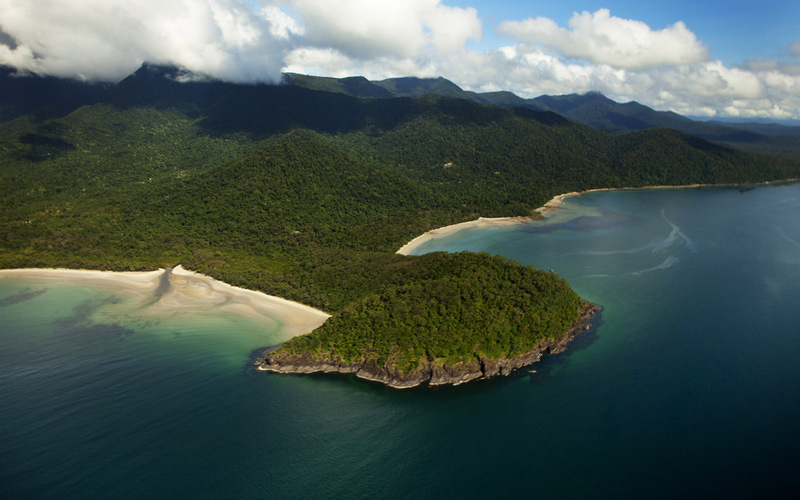 Daintree Rainforest is the jewel in Australia’s tropical rainforest crown. Its’ rich array of rare and endemic flora demonstrates the origin, evolution and dispersal of flowering plants (angiosperms). Many of the endemic species and genera are narrowly restricted within the three valleys protected off the eastern flank of Australia’s wettest point – Thornton Peak. The variations in elevation above sea level and changes in topography and soil types contribute to the conservation of diversity and complexity of the rainforest and associated communities present. Nowhere is the contribution of rare and endemic species to the composition of the forest more notable than in the Cooper Creek catchment. On the broad scale of the catchment, including Thornton Peak, over 140 species of rare and endemic species may be encountered. Daintree Rainforest lies in the lowland heart of this ancient refugial rainforest and is ideally positioned to present World Heritage values to visitors from around the world. Daintree Rainforest is habitat to some sixty-four plant species with legal conservation status. This is not the final count as unidentified plants are being discovered and are waiting for formal confirmation by taxonomists. The extraordinary level of representation by rare species is due in part to the wide variation in soil, drainage and other edaphic factors that are found in the area. A guided, interpreted walk through Daintree Rainforest reveals genera of great rarity, some that are locally common, but having ancient lineage such as Haplostichanthus, Eleocarpus, Endiandra, Stenocarpus, Planchonella, and Symplocus. The grandeur and beauty of the fan palm forests of Daintree Rainforest are breathtaking in their magnificence. Sparkling rainforest creeks and constantly varying reflections of light from the fan palm leaves lighten and enhance the brilliance of the multi-green vegetation. Cooper Creek emerges from its estuarine mangroves to enter the Coral Sea at Thornton Beach. From here the massive granite outcrops of Thornton Peak and Mount Hemmant dominate the superlative features of the landscape. The exceptional coastal scenery with its white sandy beaches and rainforest-clad mountains plunging dramatically towards the fringing reef and in close proximity to the shore, provide vistas of outstanding natural beauty. In the heavy wet-season, the high rainfall and rugged topography contribute to cascading waterfalls and a lushness that heralds the prime growing time – the most alive time of the year. The Daintree provides habitat for a number of threatened and endangered species. High concentrations of monotypic genera reflecting the refugial nature of the rainforests are found in the Cooper Valley. Included in the list are many rare and very restricted species belonging to the primitive angiosperm families such as Idiospermum australiense, (Idiospermaceae) Haplostichanthus (Annonaceae) Tetrasynandra (Monimiaceae), Endiandra microneura and Endiandra cooperana (Lauraceae). Among the fauna, there are several species with highly restricted distributions. The endangered Southern Cassowary Casuarius casuarius inhabits Daintree Rainforest. The territories of ten adult cassowaries and associated juveniles coincide with Daintree Rainforest. The Musky Rat-kangaroo Hypsiprymnodon moschatus, a species of considerable evolutionary significance and restricted to the rainforests of the Wet Tropics, is well-represented within Daintree Rainforest. Daintree Rainforest interpretation evolves through direct and incomparable habitation within the rainforest proper. The rainforest releases its secrets slowly and the intricacies of rainforest relationships become known through unexpected experiences. The intimacy of a lifestyle integrated with the biological diversity and ecological interrelationships of Daintree Rainforest is a privilege and a unique learning opportunity. Its directors take pleasure in sharing their understandings and observations with visitors to the Daintree.